Time for a much needed gaming update! I have been able to play in two sessions now of Old School Hack and am enjoying it immensely, so I thought I would share my character with you. I chose the Fighter character, and one of the fun things about OSH is that once you choose a class, no one else can choose that class. So you can only have one of each class in your party. Once we determined our classes, then we rolled up some stats. Rolling stats is easy, you just roll 2d10, then consult the chart to find out what your bonus is. You keep your stats in order, but we allows for there to be one swap. After that you get to pick one talent from the list of your available talents on your character sheet, and finally, you choose your weapon. That’s all there is to it, quick and simple to get a whole party ready. Your character sheet even has a list of equipment your character starts with, but you do get some gold in case you need anything else. I really liked how easy it was to get going with characters. Most games take a while rolling up characters, and that can be fun in its own right, but when you just want to play, sometimes that can get frustrating. OSH removes all the barriers to get you and your party started and into the action as quick as possible. Now without further ado, here is the character that I created. Below you can see the picture I found to help me describe my character. This picture is from DeviantArt, you can find it here and more from the same awesome artist. As you can see, the picture helped me to decide to go with a Very Heavy Weapon and no armor. In the two sessions we have played so far, these have served me well. Hopefully, I can post about them soon too, but for now, here is Korgoth’s back story. 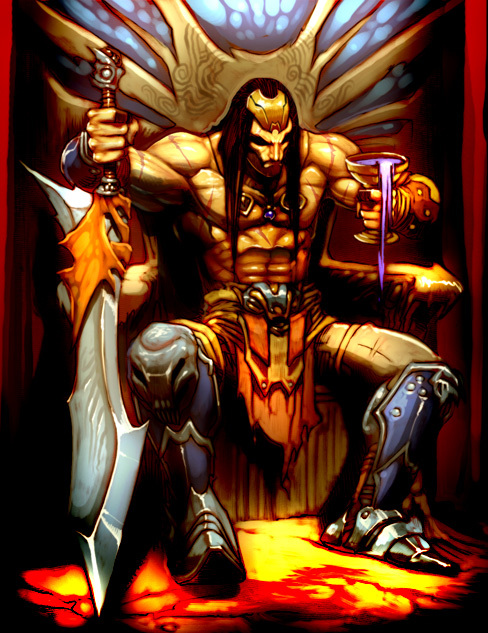 Korgoth grew up in the nomad tribe of Kweian, that roamed the grasslands of the Lyr Plateau. He lived and learned from his father Sethan, who taught him the way of warrior. When he was 12 years old, Sethan sent him to the city of Balkek to live with his mother, in order to learn about the ways of her people, in the city. It was a big change for him, but he took to it well, learning in the schools that his mother taught in, though he had no aptitude for magic. It was a fine balance to keep up his training as a warrior, while also learning in the school, but he did well. By the time he turned 16, it was obvious he was not going to have much skills as a magic user, so he decided to return to the Kweian tribe and continue to live as his father. By the time he found the tribe on the Lyr Plateau, a great tragedy had befallen them. The tribe had been wiped out completely, with nothing but smoldering ashes where there had been several hundred people. With no one alive to tell him what had happened, he searched through the smoldering remains to try find the answers, but there were none. What he did find, was the sword he now wields. It was not his father’s, nor even chief’s sword, but it was the only remaining item not burnt and twisted by the fire. Knowing that there had to be something special about the sword, but not knowing what it was, he took it with him, as he headed back for the city. I am back to working on my Mythic Emulator app for running solo adventures. It will basically just be used so that I do not always have to consult the chart. Here’s what I got so far, let me know what you think! Lanky humanoids that looked to be made from or coated in tar confronted us at the mouth of a path going into the forest. One taller than the rest stood out and made a threatening motion with his spear and we prepared to fight. Well, at least Sl’th’x did, Mara took off and vanished into the trees before the fight even began. Sl’th’x was surprised at Mara’s action, but he buffed up tall, trying to appear large and scary in the hope that it would scare off the people and leave him to the gold chuck in the ground. It didn’t work. The guy out front chunked his spear at Sl’th’x with amazing accuracy. The spear hits, but thanks to Sl’th’x’s thick scaly hide, it only produces a small wound. The wound unfortunately begins to bleed freely. This enrages Sl’th’x and he throws down his energy trident and speeds forward, attacking the humanoid with teeth and fangs. Meanwhile, some of the tar people follow Mara into the woods. She drops down from the trees and eliminates all four of them with some stunning moves. She then attempts to draw more of them into the woods so she can dispatch of them just a quick. Sl’th’x flips blood at the creatures eyes as he rushes him, but the creature is agile and avoids Sl’th’x attack. They dance around, each trying to land a good solid blow on the other, but neither is successfully. Finally, they lock their arms together, trying to overpower each other. This is where we left off for the night. It ended up being a fairly short, but fun night. The combat ended up taking so long because we were all new to the combat system in Diaspora. 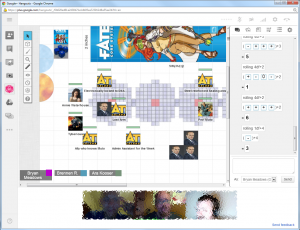 We spent a lot of time making sure we had all the rules correct and it was tough for me to figure out when and how I should use my fate points. I am positive though that next week it will go faster and will continue to do so as we grow comfortable with the system. I had to give Brennen a hard time because combat for me sure did seem like a lot of misses, but I enjoyed the game. I did miss a lot, but, it is important to remember that my character was not built as a combat orientated character and the dice were not treating me well either. 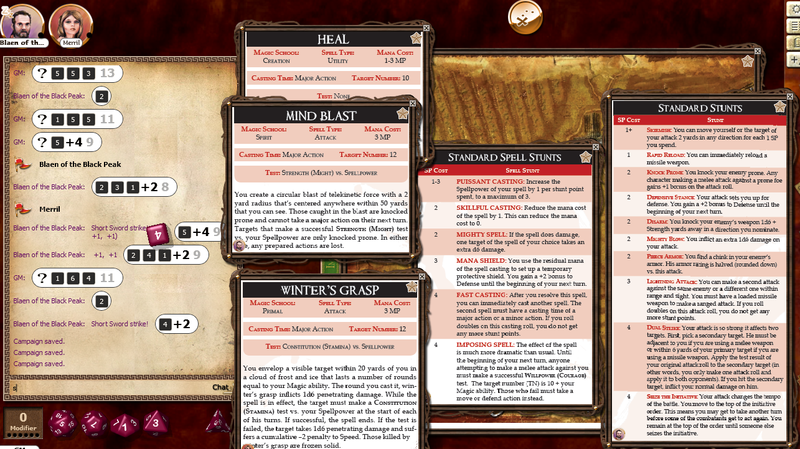 So far, I like it much better than a d20 system because I do feel that the dice are much more balanced. I am looking forward to next week and hopefully I will put some hurt on that tar creature! 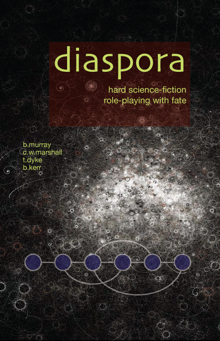 We got a chance to play Diaspora this week, ran by Brennen. The two players were me and John, and our characters are Sl’th’x and Mara. The story begins with us and two other crew members, Captain Jack Mattson and Lena, getting hit from the military for a job we had just pulled. Sl’th’x deftly gets them to a different planet, but has to sacrifice the ship in order to throw off pursuit and makes a crash landing in a large body of watter not too far from off the coast from the city. The crew ejects in a cargo container before the ship actually crashes, and are carried underwater. Sl’th’x can breathe underwater, and thanks to some drugs administered by Lena, the rest of the crew is able to endure for a limited amount of time. Mara does not seem to be able to swim, or she is starting to panic, so Sl’th’x ties a cord around him, and then ties it around her as well. His intent is tie it around the rest of the crew as well, since he is the best swimmer, and swim them all to safety, but his actions are interrupted by a giant size eel! Sl’th’x acts fast, raising his energy trident and tries to fry the creature, but misses. He then gets lucky and fries the eel, using the cargo container as a medium to delivery the bolt right into the creatures mouth, but the trident is pulled form his hands in the act. He then cannot see Captain Mattson or Lena, so he swims Mara to the surface. He leaves her there to go search for the other two. When he gets back down there, he cannot find anyone, but he sees bigger aquatic life is beginning to move into the territory. Then he sees another eel, not as big as the first, but still bigger than him, with a foot sticking out of its mouth. He looks for something to use to kill the eel with, and sees a flickering light below. Heading towards it, he finds his energy trident! It appears to be broken, but he makes a few adjustments to it and thinks it will still be able to make a couple of shots. Looking around though, the eel he saw is no where in sight. He finds no other signs of the rest of his crew, and not wanting to leave Mara alone for long, heads back to the surface. He finds Mara and another body with no head floating by her. They decide it is best to get to the shore and hope the others made it as well. Sl’th’x ties the rope back to Mara and he swims swiftly for the closest shoreline. They make it to a beach, but the environment looks very wild and foreboding. They take a few minutes to gather their thoughts, and then Sl’th’x sees something glinting with sunlight several yards down the beach. He takes off for it, and finds what looks to be a large lump of gold sticking out the sand. He reaches down to pick it up, and gets an electrifying shock. Through stout resolve he is able to let go. When he does, he finds Mara running up to him, asking him what he found. He doesn’t know, but he is determined to find out. He thinks that if he can yank really hard, he could pull it out of the sand and stop it from shocking him. He crouches down and tenses his muscles, then grabs the object again and pulls with all his might. Electric shock jolts through his body again, but this time he continues to pull and refuses to get go. Finally, the shock lessens and stops altogether, but the item does not budge. He then begins to dig around it, trying to find the bottom. This is where we ended the session for the night. It is a fun game so far and Brennen did use many compels throughout the game. I am looking forward to finding out how a longer combat encounter is going to go. I was a little disappointed that our two NPC’s seemed to have died. I was hoping that they would turn up throughout our game as valuable allies in different situations. They still might I guess, we will just have to see how Brennen plays it. We are starting a Diaspora campaign, ran by Brennen. I really like the rules so far and am looking forward to playing. So far, we have created the cluster, created our characters and talked about how we are starting out together. I enjoyed both the cluster and character creation process and the results are always fun to read. We had a lot of laughs while creating both, and I am looking forward to playing next week. I do find the character creation process a lot more difficult than most other games though, simply because there is so much more we have to think of and write. I also believe that when the options are so wide open, I have a much harder time narrowing down what I want and coming up with something that isn’t straight out of a movie or book. I don’t know if anyone else has this problem, but once I powered through it, I was really happy with the results. I decided that I did not what to play a humanoid. If we were playing hard sci-fi, then I was going to play some weird alien race. What I came up with was a naga creature that behaved more hive-like than humans. They also happen to be a little like dragons in the fact that they desire to acquire a hoard of treasure. The closest picture I could find that is similar to what I have pictured in my mind is the creatures from the world of warcraft game. Here is my character in our upcoming game. Let me know what you think! Hatched on the planet Zemm, Sl’th’x was trained in two primary categories; piloting and engineering. Sl’th’x showed much more aptitude than normal for learning, than normal workers need, and was assigned to Ryth colony learning center. Ryth are much larger than Zemmese and Sl’th’x had to make up for it by being quick of both mind and body. Sl’th’x quickly learned that technology and speed can make for his weaknesses among the Ryth. Many Ryth suffered malfunctioning equipment or shocking surprises due to their harassment of Sl’th’x, of course, sometimes his own devices backfired on him. Once he finished learning center, Sl’th’x was assigned upgrade most of the systems on planet Olynks. Olynks was mostly a mining planet, and far from exciting. Sl’th’x worked hard so that he could get off that planet as soon as possible and due to his work ethic, he was assigned to ship piloting and maintenance when his work order was complete. Sli’th’x piloted many of the different ships throughout the Crichton system. Once, at the edge of the Crichton system, Sl’th’x saw a ship from outside their system and thought it was beautiful. He grew determined at this point to explore other systems once his service is up. Technology is power in the Crichton system, and Sl’th’x is determined to learn and use all available. Sl’th’x has admired the hoards of many of the older colleagues that he learns from and looks forward to growing his own one day. Noting Sl’th’x desire to see other star systems and his abilities with both piloting and technology, the Nests decide to assign Sl’th’x to the Foreign Technology Acquisition Division (FTDA). Here they train Sl’th’x in subterfuge, acquisition, and fighting. He then is sent with a team on a mission and gets to pilot his first ship outside his system, a big mining vessel. The mining vessel has some hidden capabilities in both weapons and stealth and they are sent to capture a newly designed ship in the Herbert system. They are taking a cargo load of special ore to one of the houses in Herbert as their cover. Something goes wrong, I’m still not sure what, maybe we underestimated one of the bribes or something, but some of the crew died leaving Sl’th’x in charge. The mission unaccomplished thought, and he had to figure out someway to salvage it. Luck came in the most unexpected way, a request for discrete transport from a humanoid girl. He could not resist giving a ride to a humanoid girl, Mara, when she shows him the pouch full of gems she is offering for the ride. Once he takes her to where she needs to go, she also helps him by letting slip a couple of locations of private house ports that have the ship he is looking for. He is able to use the gems to make bribes to get into one of the ports and is able to steal the ship and complete his mission, earning him a lot of status from the Nests. Sl’th’x has now completed his required service to the Nests and has set out on his own. Deciding to go into the outside world, the Nests insisted on training him in the way of combat before sending him off to collect his own hoard. This training comes with an understanding that he can be tapped, and paid well, for Nest missions if required. Captain Jack Mattson assembled a tight crew for his infiltration and retrieval mission. He was the leader with all the plans and contacts, I was the pilot, Mara would handle entry, and Lena could handle the silent and non-lethal method for dealing with the guards as well as be able to patch us up if necessary or enhance abilities with drugs for a short time. We could all handle ourselves in a fight, and I probably the least experienced in that area. The plan went flawlessly, until the end. Then we had to fight our way back to our ship. Even that wouldn’t have held us up if there hadn’t been a military ship arriving in orbit just off world. They tagged the ship I had been promised in payment, as well as my image before I jammed them. Fortunately for me, most of my race look alike to humanoids. I made it to the next world before the military was on us too hot to evade. Captain gave a command then that me me think he was crazy. Crash the ship he said. Using some of my best maneuvers, I got our ship over the water close to a city. Lena administered some drugs to the others, but did not know how they would affect me. I told her they were not necessary. The captain nodded, but I could tell he wasn’t sure if I would survive or not. I allowed the ship to take a direct hit, and then crashed it into the water, making sure it would make a big explosion. Fortunately, we jettisoned into the water just before, making sure we went deep. I had no problem, we can breathe under water, and thanks to the drugs, the others didn’t either. When we made it to the city, we were glad to learn that the military counted no survivors of the unfortunate ship malfunction and crash landing into the water off. Captain asked what he could pay me for sacrificing the ship like that to save us all. I smiled and said a copy of the plans we stole would do. He didn’t like the idea, but he agreed to it. Humanoids don’t mind stealing for other humanoids I guess, but they don’t like the idea of my kind getting ahold of some of these secrets. Those plans made me a modest fortune when I turned them over to the Nests. Military technology is always among the best technology. I was able to by my own small ship with that. Looks like I could go into business for myself now. Sl’th’x has made his way to the Pohl galaxy and has been content to get a good base of operations going as a transporter of goods. His ship may not be the largest or fastest, but he is a reliable pilot that is not afraid to travel to any galaxy. He has built up his reputation as a dependable transporter and has been able to use it as cover to move some of the Nests operatives when the need arises. He continues to look for information about new or rediscovered technology of interest, as well as anything that can make him money. He has started to collect items from the worlds and systems he visits. He is now seeking a rare book that is said to detail how to use the mystic power of the Pohl monks and the ways to use N’Aurbeen spice to alter the minds of others. This book is only rumored to exist and the rumors stats that the monks will go to any length to destroy copies outside of their hands. If it exists, the Nests would find it very interesting. Civilian: can be piloted without military training. Skeleton crew: can be piloted with as few as one crew member. Interface vehicle: has a separate vehicle capable of landing on planet surfaces. Firewall: base defense 2 against EW. Last weekend I finally had the time to finish reading the Dragon Age RPG and run it too! It was a pretty easy read and the rules are light, so there is not too much you have to remember. The good thing though is that the game has enough rules to make leveling up and actually running a campaign fun. To often I feel that rules light games have no feeling of advancement, and that is not the case the Dragon Age. 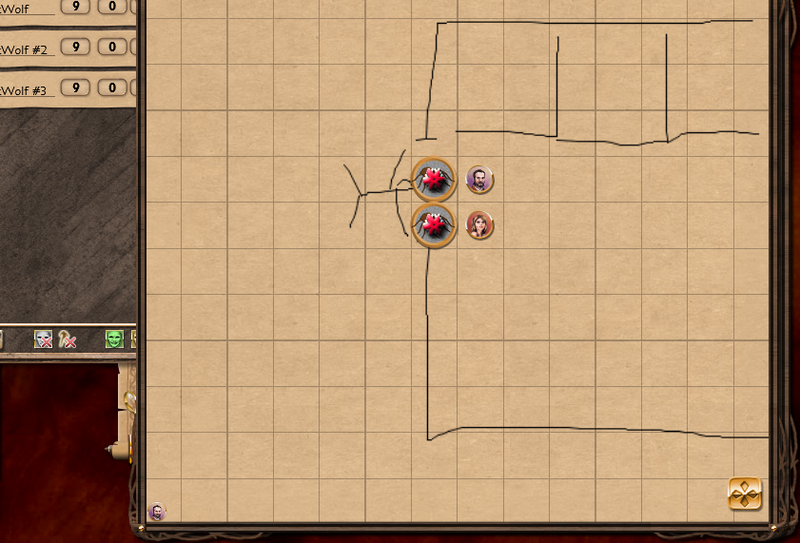 I decided to run my online game in Fantasy Grounds, with voice through Skype. 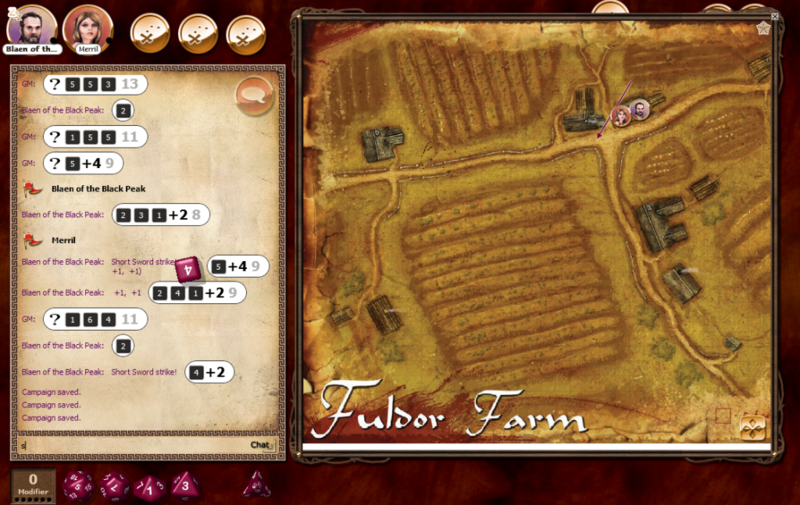 I hadn’t used Fantasy Grounds in a while, and I found that I had missed it. 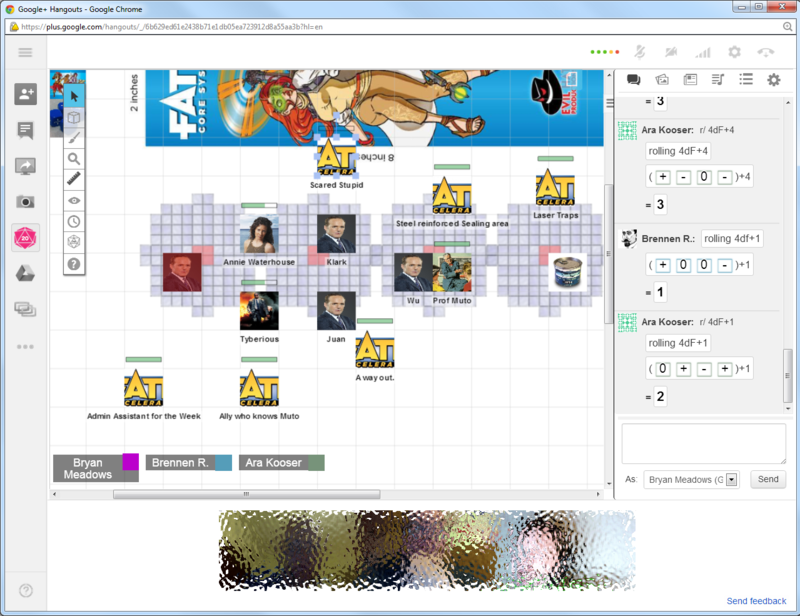 I enjoyed look and feel of the program, but it does take a little bit of work to run a game in. 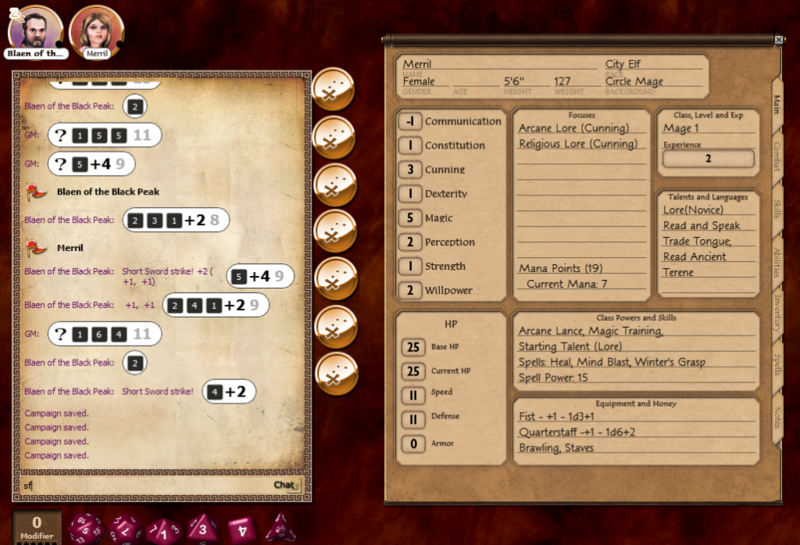 I ended up taking a lot of time over the weekend making a character sheet. It turned out looking pretty good, but I would like to make it look better, as well as add the rules into Fantasy Grounds as well. You can see the character sheet below. 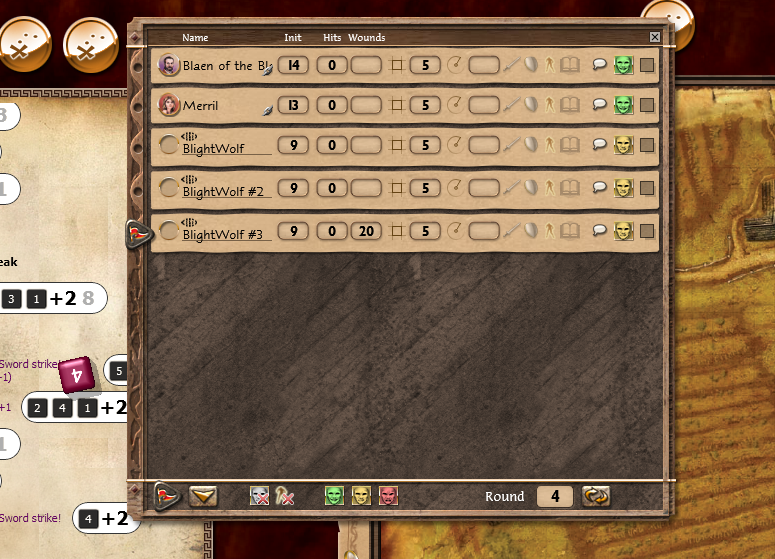 I did get some of the rules into Fantasy Grounds, but I cheated a little. I took pictures of the PDF and inserted them in as pictures. 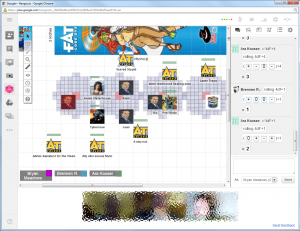 It worked well though, for the few rules that we had to remember for the first session. You can see them in the picture below. Again, hopefully I’ll be able to program in some of these rules when I get the chance. I’m not really good at creating rule sets for Fantasy Grounds, but I am trying to learn. 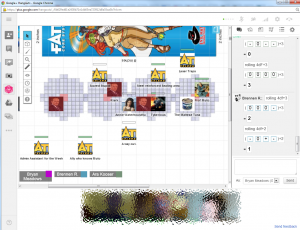 The game is the beginning of a mini-campaign that will last several game sessions. 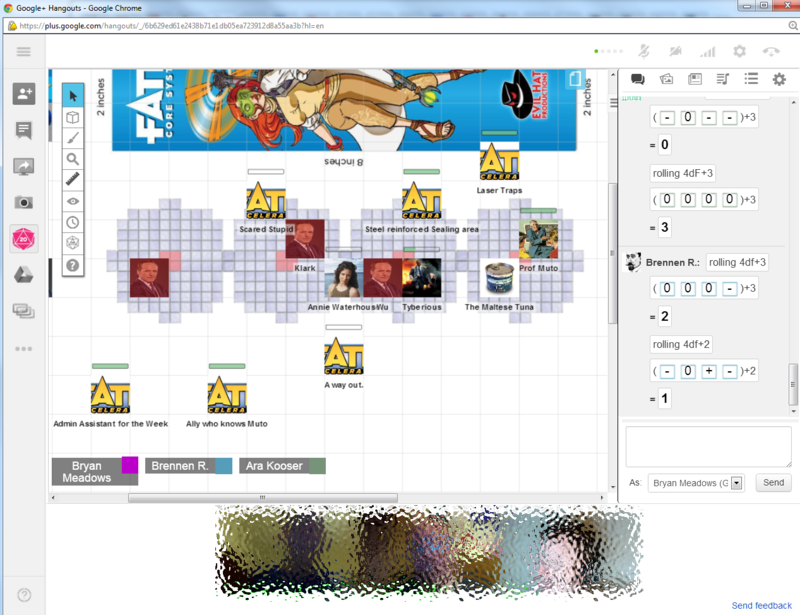 We wanted to run a game for longer than one or two sessions so that we could get back to that old school feeling of running with one character for several levels. Snikle was my only player for the first game. He ended up running two characters, and the rules were simple enough that he had no problem running both. We hope for some more players as we continue the mini-campaign. Snikle played a rogue by the name of Blaen, and a mage named Merril. While they were traveling, they encountered a body in the road in the middle of a couple of farms. Upon close examination, the body appeared to be that of a farmhand, and it was badly torn up by something with big claws and big teeth. The blood was mostly dry, so it hadn’t happened in the last few hours, but the party still was a little nervous. It didn’t help that the sun had already set. Of in the distance, Blaen could see the lights of a town, about 20 minutes or so journey away. Looking around at the other farms though, he didn’t see any lights at all. He did notice crows, perched upon the house to his left. He could feel them watching, waiting for him to leave so they could resume their meal. Blaen suggested they camp-out the night in one of the barns, thinking that whatever had done this, would not be returning. Merril agreed and they headed for the nearest barn. Before they got to the barn, they encountered two more bodies. One was just outside of the barn door, and all the barn wall, there was a word written in blood. Merril said it was in Elvish script, but she could not read it. They grew a little more nervous here and decided to get out a light and look into the doorway with the light before going in. Looking in, they saw the barn contained a horse and a couple of cows, all still alive. Nothing else looked troubling, so they headed in and when looking en every corner to make sure nothing was hiding. They did not find anything, but they did hear a moan, as if someone hurt, from the loft. Before Blaen could head up the ladder into the loft, three blight wolves appear in the doorway. 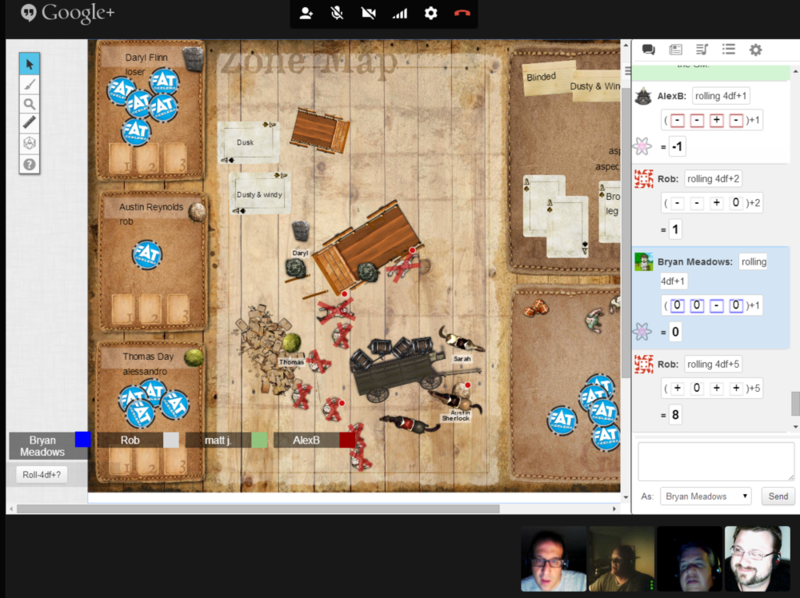 Everyone rolled initiative and the battle began. I had to draw a little battle map quickly, then we got some tokens to represent the wolves. The tokens look like spiders, but don’t let that fool you, they are definitely wolves. Blaen held them at the doorway, allowing only two to attack while the other one waited to for a way in. Blaen did okay, but he was no match on his for the two wolves. Blaen sliced them up while Merril cast spells, but Blaen ended up taking a lot of damage and needed a heal. Merril was able to freeze both of the wolves solid and when the third wolf saw his two companions slain, she ran off. We ended the night with the battle and plan on playing again tonight. Even with both of us being new to the system, the battle went pretty quick. It was much easier than most systems and we really enjoyed playing. The system uses 3d6 to determine all rules. I really think this is what made it so easy for the player, even running two characters. We both liked the system and had a fun time and we are looking forward to playing tonight. Check it out if you have a chance! Dirk Chandler is 42 and is still in prime physical condition. He maintains his shape by continuing to train with firefighters, but he is no longer one. He is the owner of Chandler’s Books and searches out the old, rare, curious and strange. He has close cropped blonde hair and a bushy mustache. He wears rugged outdoorsman clothes and can most often be found in his bookstore or with his good friend Father Locke at St. Patrick’s. Father Locke – a catholic priest just a few years older than Dirk that is close friend. Though Dirk may not agree with all Locke has to say, he respects him and shares many a tale with the Father. They enjoy sitting around telling stories, talking about old books, and drinking good whiskey. Cordelia Callahan – Dirk’s love interest. Cordelia is about 11 years younger than Dirk and has been married before. It did not end well for her, so she is only interested in taking it really slow with Dirk. They have been seeing each other for over a year now and are close, but anything more is still a long ways off. Cordelia is a journalist for the Chicago Tribune. Kurtis Trent – Dirk is not sure if he even knows this mysterious persons real name, but he is Dirk’s contact for old or rare books. Kurtis will come to Chicago every few months and have new things to sale to Dirk. Dirk suspects these items are acquired by less than honest means, but cannot keep his curiosity in check enough not to buy items from Kurtis. Kurtis often makes him feel a little uneasy, but it is worth being around him to get a chance to see some of the treasures he brings to Dirk’s store. Cortez Trotter – Current fire chief that was on the fire brigade with Dirk when he was still a fireman. They are friends and the chief allows Dirk to still come and train with the firefighters, but they keep most of their talk to tales of their old exploits as firemen. 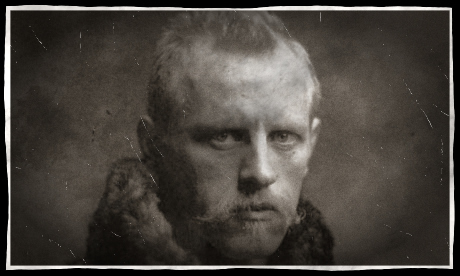 Dirk was a firefighter during the great Chicago Fire of 1871. It was a horrible incident where Dirk saw things that he could not explain. After the fire, he left Chicago to travel a while and came back with a small collection of rare books and the idea to start a book store. With a little help from some of his family, he was able to open and maintain the bookstore. Dirk lives above the store and maintains a modest lifestyle, most would be amazed to know that he has amassed quite an amount of wealth through his collecting and selling of old books (those that do not interest him enough to keep). He spends time collecting old, rare, or curious books, and researching about the occult and other things pertaining to the arcane. He is still trying to find the answers to the experiences he had in the great Chicago fire.